Info "Looks can be deceiving! Move the Form Baton to take a closer look." Wario PI is a microgame in WarioWare: Smooth Moves. It is in both Wario's stage and Tiny Wario's stage. The name may be calling Wario a "Private Investigator" which is a type of detective. 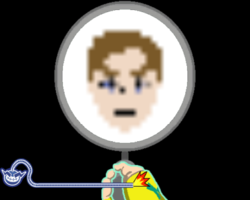 The person is controlling Wario and is trying to view something with a magnifying glass. However it is fuzzy so the player must either move the Wii Remote back or forward to get it into focus. If succeeded, the player may get a view of an UFO, some ice cream, a (very man like) woman with a mustache, two donuts, or even the player's own Mii. There are almost no differences between the levels, and it may be that they are the same difficulty. Sometimes, an UFO with three aliens found in Number Cruncher, from WarioWare: Touched! must be viewed. This page was last edited on February 18, 2018, at 20:05.